You are thrilled with your new up-to-date appliances. They preserve food perfectly until you are ready to prepare it. The temperature and evenness of your gourmet food is just right thanks to your new oven and cooktop. The streamlined sensibility of your contemporary kitchen elicited “oohs and aahs” from your guests. The party was a hit, by the way! Unfortunately, now you’re on your own again, alone with the mess of a successful party. Don’t fret. 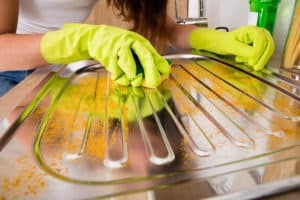 With a few simple hints and techniques from the pros, you will have those countertops gleaming again in no time! 1. The first step is the same, no matter what your surface is made of. You have to get rid of the grease, gunk, food, and whatever that sticky stuff is. Use a sponge (the soft side, not the scrubbing side) or a rag wetted with warm water and dish soap. Rub in a circular motion to cover countertops, stovetops, backsplashes, cupboards… anywhere the food and drink has dripped or splashed. Don’t use abrasive cleansers, which can scratch the surfaces. Use bleach gently, as it can discolor the surfaces. You can use a soft toothbrush to clean out cracks and seams. 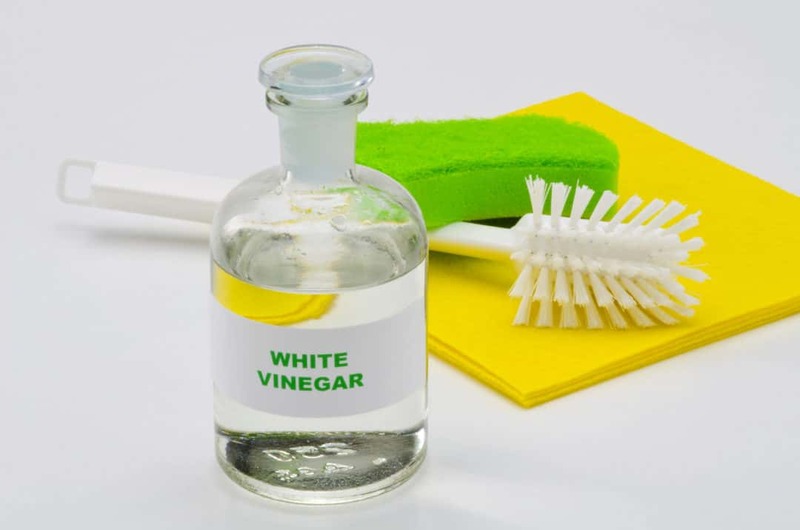 If you prefer natural cleaning methods, or if the countertops are ceramic tile, you may choose to use a mixture of white distilled vinegar and water instead of soapy water. Soap can leave buildup on ceramic tile. 2. Now, the rinse cycle. Rinse out your sponge or rag and go over everything again. Repeat until all soap is washed off. Then squeeze out the sponge or rag and give everything a quick once over to dry up most of the water. 3. For stubborn stains and grease buildup, create a paste from baking soda and water or use white distilled vinegar and water. Scrub with a soft brush and repeat if necessary. Marble countertops are easily marred by acidic substances, so wipe off wine, juice, tomatoes, and soft drinks before they set. For wood, blot up spills immediately. If the wood stains, rub lemon and salt on the spot. 4. Microfiber rags are a genius invention. Use these to finish drying and polishing countertops and surfaces. Rub in small, tight circles, as if you were cleaning a window. Also, if you have any countertop lights that tend to heat the surface, it will make the soapy solution or water dry too quickly and streak, like polishing a car or cleaning a window in the hot sun. So, leave those hot lights off. 5. Many surfaces don’t require sealing after cleaning. Marble countertops require sealing with products made specially for marble. For wood, massage in mineral oil or lemon oil without drenching the wood. Too much will attract dirt and grease. So with a few easy steps, your kitchen will be sparkling again and ready for the next festivities! Remember C&W Appliance is here to repair your appliances. Don’t wait if you need something fixed. Give us a call at (855) 358-1496 today!